Low Vision Rehabilitation services are often recommended for patients suffering from a visual impairment not correctable by standard eyeglasses, contact lenses or surgery. This decrease in vision may be attributed to macular degeneration, glaucoma, diabetes, stroke or head trauma. Visual impairment is unfortunately a common affliction of older adults. 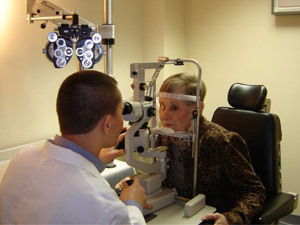 In fact, 14 million Americans – one out of every twenty – suffer with “low vision”. The National Eye Institute, a division of the Federal Government’s National Institutes of Health (NIH), has done extensive research in the field of visual impairment, or “low vision”, during recent years. More than $22 billion is spent annually in the United States on care and services for the blind and visually impaired. Even with this huge cost and renewed focus on the subject, there is a definite lack of awareness. In our practice, special time and emphasis is placed on working with patients suffering from visual impairment. Dr. Harry Halscheid handles this aspect of our office. His experience includes serving a Clinical Externship at the William Feinbloom Low Vision Rehabilitation Center at the Pennsylvania College of Optometry, where he was recognized with honors in patient care. In working with low vision patients, the activities cited as being most affected by visual impairment are driving and reading. Cooking, sewing and other daily activities are often negatively affected as well. It is very easy to understand how visual impairment may lead to a drastically reduced overall quality of life. By using specific optical devices such as magnifiers, which will improve their ability to see detail (read and watch television). By learning to use their remaining vision. There are specific eye movement tasks that may allow this. Most importantly, Dr. Halscheid will help patients with visual impairment discover the many resources available to them in Chester County. (Many of these services may be found in the Patient Resources icon on our website.) Advances in Low Vision Rehabilitation today allow patients to pursue their interests, remain mobile and independent, and improve their overall quality of life.